Segun: We both attended the Assemblies of God Church in Ile-Ife, Osun State in 1993. We were in different branches of the church but we met during a joint programme. How did you know both of you were meant to be husband and wife? Segun: It was more of conviction rather than vision or dream. We started a drama group and I was very passionate about it. At the time as a young Christian, I was lost in my vision. All I was thinking about was how to realise my vision. She supported everything I was doing. That endeared me to her. Even though I was convinced she would be my wife, I was a bit reluctant. I was studying for my master’s degree and she was a secondary school pupil, awaiting her results. There was a wide education gap. I was admitted into the university as a teenager and even graduated as a teenager at 19. I did my National Youth Service Corps programme at 19. By the time I was 20, I was already doing my master’s degree. I was 25 and she was 22 when we eventually got married. What convinced me eventually was a revelation I had that she did a project on the problems and solutions of our current ministry and submitted the project to me. That was how I knew she was the right woman for me. Sumbo: When he proposed to me, I was not even ready for marriage. The education gap, as he said, was wide. I was not ready for it. I prayed and God gave me the go-ahead. The only thing that attracted by his passion for his vision. He was not even handsome (laughs). That is the truth. But he is handsome now. He didn’t have much, not even a job. I saw the zeal to do the work of God in him. I saw him as someone who has the fear of God. Segun: I didn’t tell her stories. I just called her after a programme in the church. I proposed to her around in February 1994 and she responded around April same year. She had been awaiting university admission for about two years after secondary school. It was the day she agreed to my proposal that she got her letter of admission. We eventually got married when she was completing her education. Six months before I proposed to her, I committed a blunder. I proposed to another sister in the fellowship because she fitted into my perception of a good wife. I went to the sister and proposed marriage to her. She said I should see the president of the fellowship about my proposal. When I got to the president, I was shocked by what he told me. The president said, “Bro Segun, you are the 11th brother that has come to me to say God asked him to propose to this same sister.” I said, “I am number 11? Waoh!” I hated myself when I heard that. My ego was deflated because I thought I had prayed well. I went into spiritual comatose because it meant that I did not see correctly. I made up my mind not to talk to any lady again until I was sure God was leading me. Was there opposition to your marriage? Sumbo: My parents felt I was too young to get married. They believed a 22-year-old girl could not make a successful wife. They also believed that I would not finish my education if I got married. Segun: My father, the late Chief Segun Okeowo, was not happy with me because I said I wanted to pursue ministerial work. He was against the marriage initially. My pastor at that time, Bishop Oladimeji, and one of his friends, accompanied me all the way from Ile-Ife to visit my dad in Shagamu, to convince him to support my marriage. When my father looked at the calibre of those who came with me, he accepted. Pastor Oladimeji went with me to the family of my wife’s mother too, to convince her. She said if men of God could say yes, she would agree. But she gave us a warning. She said, “You said God has spoken to you to get married. I don’t want a situation where both of you will get married and come back to beg for food from us.” It wounded me. My wife and I then had an agreement that even if we would go hungry, we would never go back to her parents for food. We didn’t even though things were rough. What is the most difficult challenge of your marriage? Segun: Blending together as a couple is the most difficult because we are two different personalities. Blending in marriage takes a lifetime. I come from a family that is quite different from my wife’s. When I was 12, my father gave me a room to myself. I did anything I liked. My parents hardly entered my room. I was independent. I got married to a woman who stayed in her mother’s room until the wedding day. When we got married, that became an issue. When I went out to play football when I was younger, I threw my trousers anywhere I liked. When I got married, I wanted to keep doing same thing and it was strange to her. When she sees my clothes scattered in the room, she would say, “What kind of man is this?” I would say, “And so what?” That became an issue. The first month after our wedding, we thought it was all over. Despite correcting me many times to put things in the right places, I still threw trousers anywhere I liked (laughs). Sumbo: At first, it was a thug of war because we quarreled a lot. At a time, I kept calm. When the room is scattered, he won’t complain so if he is on the bed, I would pack the clothes and tidy up the room. I just have to live by it. Who apologises first when you quarrel? Segun: We have a standing rule about quarrels although we broke it once or twice. We have a 12-hour standing rule that if we have any quarrel, we must resolve it within 12 hours. There was one that lasted for about 48 hours. We heaved a sigh when we reconciled. Those 48 hours were tough. Sumbo: When both of us are angry, I would wait for him to make peace. I would be expecting him to apologise to me. When he does not and I see the quarrel is lingering, and I want to pray and have peace with God, I would make the first move. Sometimes, he would call me and apologise too. There were times I apologised to my husband even when I knew he was the one that was wrong. Why do you think some marriages crumble? Segun: For marriages to work, they require work. There is no marriage made in heaven and no perfect marriage anywhere. Good marriages happen when both partners make up their minds to make it work. Sumbo: People misunderstand compatibility. I want to say there is no compatibility anywhere. We must make our marriages work, irrespective of the differences. Some men and women want to change their partner and this is where they get it wrong. How do you handle advances from female fans? Segun: We don’t have much of that in the Christian movie sector. We have secrets admirers. When a female fan calls and asks for counselling, I direct her to my wife. For women, don’t ever say you trust your husband and that he can’t cheat. When it comes to such matters, no man is trustworthy. Even the biggest general overseers are not perfect. No man is trustworthy. What a man needs to do is to protect himself from such advances. What lessons have marriage taught you? Segun: I have learnt that marriage is a school where you matriculate and you don’t graduate. I have learnt that marriage is a school where you collect certificate before taking the examination. Sumbo: We do everything together. We sleep in the same room as husband and wife. We are like friends. Doing things together strengthens the relation. There were times we wanted to quit the relationship, but a customer, client or church member would call either for business purpose or for counselling. I would then have to contact him. We knew we could not go to the pulpit without settling our quarrel. So that helped us. Segun: My wife is a goal-getter. She is very passionate about her looks. I am not passionate about how I look. She wants to see that things are done, especially when it comes to matters of the home and our business. She is very industrious. 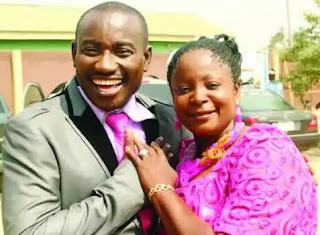 Sumbo: My husband is a true child of God and a man of vision. Sometimes, I pray for God’s help because when he has a vision, he is ready to pursue it even to a fault. He is very strict and principled. He is also a giver. My husband is harsh. I am softer. When he wants something, sometimes it is hard to convince him otherwise. Such things may cause a quarrel. He may insist on his view. To be candid, that side of him has really helped me too because there were times I could not stand on the altar to minister. There was a time I could not write a script but he persistently told me I could do it. What is your advice to would-be couples? Sumbo: We advise couples to understand that no partner is so perfect. Every marriage needs an elderly third party who both partners respect or fear. Someone once said couples should not allow a third party but it is wrong. Every marriage needs coaches. Segun: Make up your minds for the marriage to work. If your husband has nobody he fears and respects, don’t marry him. Don’t marry a man who fears nobody. A man who does not have that kind of person in his life is not a husband material. A young woman who just got married took the key of her room in her parents’ house. The new bride’s younger sister asked her to give her the key, since she was going to her husband’s house. The new bride refused saying, “Just in case anything happens, I can have a place to come back to.” One does not need a prophet to know that such a lady would not last in her home. She had refused to burn the bridge.